Most law firms have a way of categorizing attorney efforts within a client relationship. A typical client account may be organized around an Originating Attorney, Billing Attorney, and Working Attorney. Originating attorneys are typically responsible for developing the client relationship and mostly responsible for ensuring the client remains happy. Billing attorneys are often experienced and inserted into the relationship to support an originating Attorney who does not have time or skill sets to manage all aspects of the client relationship. Working attorneys include any lawyer who works on a client file. 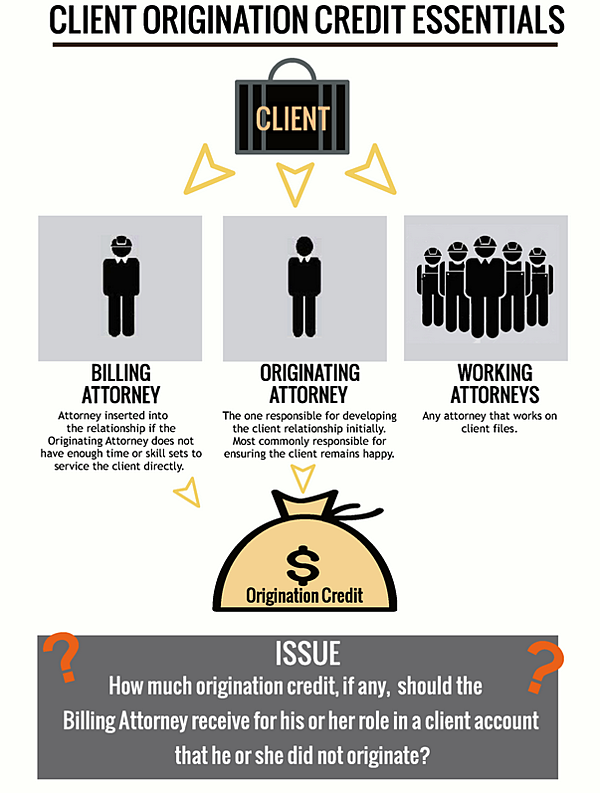 Law firms and originating attorneys can struggle to decide if and how much origination credit to award to a billing attorney. One issue is most law firm compensation systems compensate for working and originating attorney contributions. In many instances, the only way to reward additional compensation to a billing attorney is to apportion some origination credit, which creates a misnomer because it implies a business development competence that may not exist. The role of the billing attorney in the client account. Is the billing attorney only reviewing and sending out bills or does a larger role exist? For example, functioning as first chair trial lawyer on client cases, participating in client relationship activities, direct client contact and case assignments, supervision of junior lawyers and file management are all attributes of a larger role and deserve compensation. Reviewing bills and dealing with client inquiries and appeals do not warrant origination credit but may qualify for a fixed bonus. The compensation level of the billing attorney. The average experienced working attorney salary often falls between 30-40% of personal fee collections, and billing attorneys who are compensated above this range are likely receiving implied compensation for other contributions. We recommend compensation categories to recognize file management (including supervision and training) and client relationship management contributions. The opportunity cost to the billing attorney. Billing attorneys who have clients of their own will not function in a support role without receiving credit. Determining the amount of credit to share is a process best determined by reviewing the firm’s economic model and the profitability of shared clients. For example, if market conditions and the firm’s economic model indicates average compensation of 35% (base before benefits) of collections to the working attorney and 15% of collections to the originating attorney, any additional compensation to the billing attorney typically must come from the origination portion (15%). Applying the concept of an economic model to each client requires a client net income system and is recommended. Understanding the profitability of a client will allow a firm to stay within its economic model on a client by client basis. Law firms who suffer from inefficiencies can typically trace them to two either firm-level management decisions and or weak management at the file level. Splitting profit credit rather than gross fee credit at least encourages stronger management at the file level. 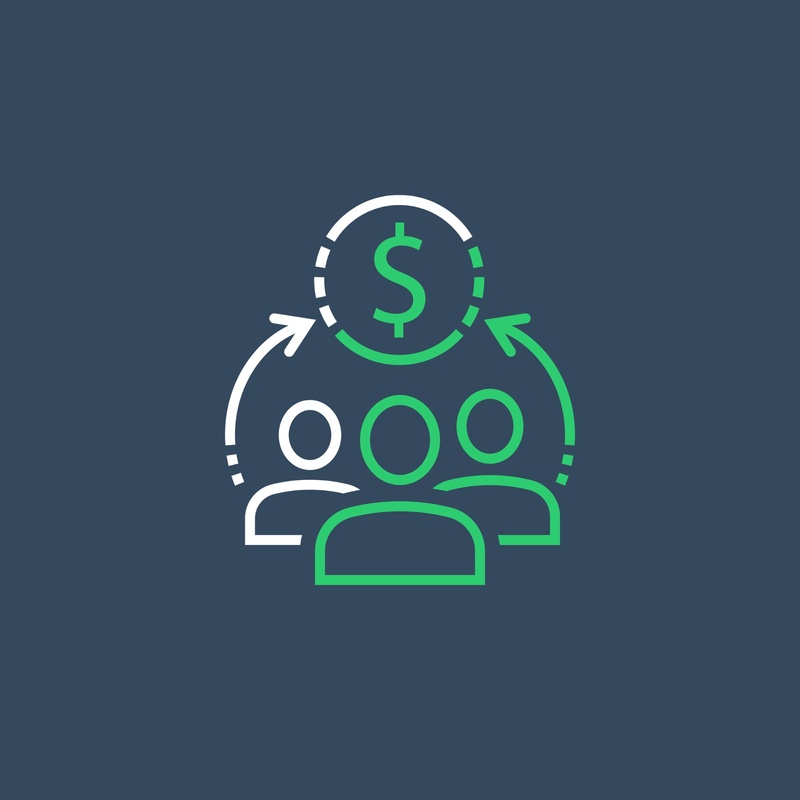 In our example, an originator may decide after reviewing a client’s profit, that it is possible to share 2-4 % of the fees managed by the billing attorney. Firms that have a mature client profit system and who are transparent at non-partner levels can share profits rather than gross fees. Either system can work so long as the underlying economic analysis is sound. Awarding billing timekeeper credit to attorneys who are not completely committed to the success of a client relationship will only mask weaknesses and distract the firm from promoting or recruiting a better person. Awarding origination credit to those who deserve it will spur growth, support retention, and make the firm stronger. PerformLaw can help with in managing origination credit and other compensation matters for your firm. Don't wait. Contact us today.